When it comes to charitable giving during a disaster, we are called to give like the widow. We give deeply and with a goal and purpose in mind. Many have said disaster recovery is a marathon, not a sprint, and our giving must be also. It can be tempting to respond to every emotional plea for help, or to the first request we see, but strategic giving is important. Immediate crisis response is handled by city and county first responders and the American Red Cross; it includes immediate rescues and evacuation efforts. It also includes many faith communities that open their doors as immediate shelter. Often there are requests for donations of shoes, blankets, clothing, diapers, food and water. Donations during for this phase are best coordinated through American Red Cross, United Way, Texas Baptist Men, the Knights of Columbus and local churches or schools functioning as shelters. Intermediate transitional recovery helps people to leave crisis and temporary shelter, return home to assess damage, and find a place to stay while longer-term plans begin. Catholic Charities agencies are fully engaged in this intermediate transitional phase, and donations to a local Catholic Charities are critical for this transition. Cleanup efforts are continuing during this phase. Helpful giving in this phase includes gift cards to grocery stores such as H-E-B, Kroger, and Randall’s; home-improvement stores such as Home Depot and Lowe’s; and outlets such as as Wal-Mart, Target, and Bed, Bath and Beyond. (BBB is a significant in-kind giver of linens and kitchen supplies.) Visa and MasterCard gift cards can be used at all retailers. Cleaning supplies are needed more than bottled water in this phase of recovery. Both transitional and long-term recovery are coordinated through Voluntary Organizations Assisting in Disaster, or VOAD. This is when Catholic Charities and the Society of St. Vincent de Paul become essential. Donating to organizations who are members of the local VOAD in the impacted cities or cities with evacuees is most effective. The long-term recovery phase includes rebuilding, restoration, return to work, school, and a sense of the new normal. Recovery from catastrophes such as Hurricane Katrina or Hurricane Harvey takes years; during that time, those impacted may remain evacuated in other cities while rebuilding their homes. In these cases, it is helpful to donate to organizations closest to the evacuees. Remember, even if someone’s home damage is minimal, their ability to return to work may be impacted by the damage to their place of employment, thus still creating financial stress for their families. Your donations to United Way can go to agencies at any of these three levels, or you can target the specific disaster assistance you would like to support. National Donations. Donating to Catholic Charities USA enables Catholic Charities agencies around the country to gather teams of loaned disaster case management staff to deploy to the impacted agencies. This type of assistance is critically important in communities where the staff of Catholic Charities are also personally impacted by the storm. CCUSA’s text to donate link makes donating simple: just text CCUSADISASTER to 71777. 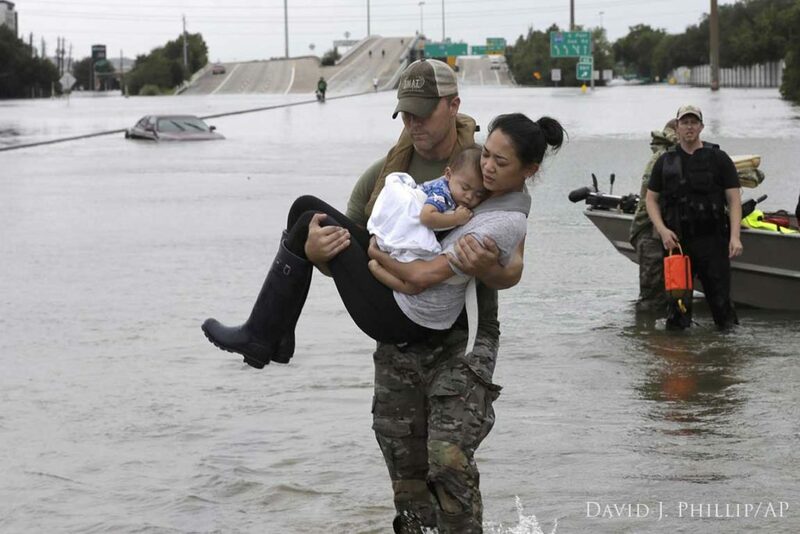 We recall Christ’s words: “For you always have the poor with you.” (Mark 14:7) Even though Hurricane Harvey has destroyed thousands of homes throughout southeastern and coastal Texas, we must remember that there are still expectant mothers, foster children, veterans, the mentally ill, and countless others who needed assistance before the storm and continue to need our charity. 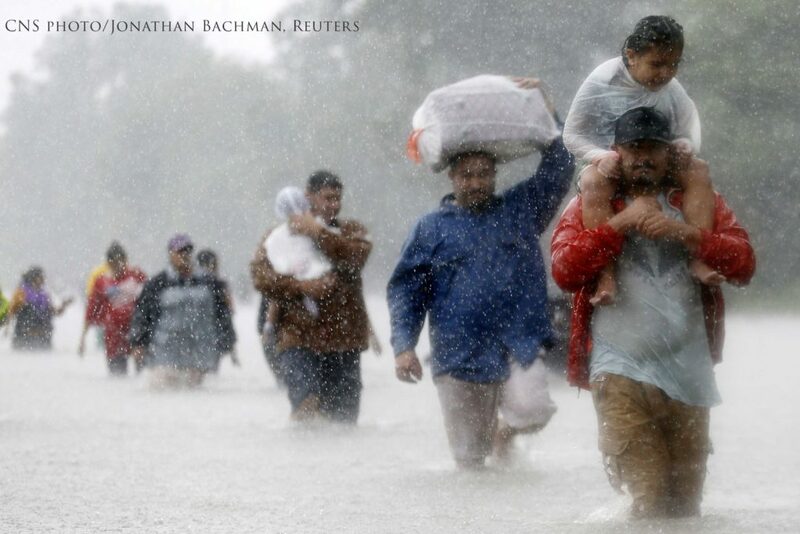 Giving to disaster relief should not replace current charitable and parish giving. In such disaster, we must aspire to the greatness of the widow, who “put in everything she had, her whole living.” We all know that the hearts of Texans are deep, and today we ask you to dig deep for those most affected by Hurricane Harvey.